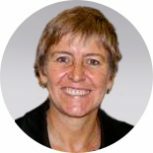 Jeannine Hahn – All Stars Project, Inc.
Ms. Hahn serves as the Senior Vice President/Chief Finance and Operating Officer and has overseen all financial and human resource operations for the All Stars Project since 1992. In the early 1990’s, she also managed the All Stars Project’s door-to-door canvas operation that produced over $800,000 annually and introduced thousands of donors to the organization. This grassroots effort paved the way for All Stars’ financial growth and stability. When the All Stars Project decided to purchase a 31,000 square foot facility on 42nd Street in Manhattan in 2002 and renovate it as a new center for youth development, Ms. Hahn’s leadership to ensure financial stability before and after the project was critical. In 2007, Ms. Hahn led a team to refinance All Stars Project’s mortgage to enable a $6 million renovation of the building’s façade and mechanical systems. She was responsible for overseeing the construction project’s budget and schedule.